One of the biggest drawbacks of being a freelancer, digital nomad, or remote worker is not having a sense of community. Yes, working outside an office has many great benefits, but it can get lonely without anyone to bounce ideas off of or commiserate with when things get hectic. Let’s face it: it’s tough to build a professional network if you’re on your own, especially if you’re in a new locale. Many people don’t enjoy networking events and prefer to build their professional network more organically. Even if you work in cafes or libraries, how often do you actually talk to your neighbour, let alone ask for feedback on your latest proposal? Even if you did (and assuming they actually wanted to talk to you), how likely would they be a seasoned professional who could give meaningful feedback? In my experience, the only “professionals” I’ve met while working in cafes tried to recruit me for MLM or pyramid schemes! In my decade of freelancing, I’ve found that coworking spaces are the best place to meet like-minded peers and build your professional network. Unfortunately, despite the massive growth in the popularity of coworking, I’ve also seen lots of people join my coworking space and leave rather quickly, often remarking that the space didn’t meet their expectations regarding community. So what’s the best way to build your network and get the most of coworking? First of all, there is definitely a burn-in period in coworking spaces; don’t expect everyone to know you right away. It took me a good month to really start making friends and professional connections. I often only formally met people after seeing them every day for weeks or months. “But everyone looks so busy! I don’t want to interrupt them,” you might say. Yes, everyone is working and looks like they don’t want to be disturbed, but remember, most people visit coworking spaces because they want to get out and have a community. I have a home office myself but choose to work at a coworking space for this very reason. So do how you meet people when they’re working? Just say “hi” to your neighbour, introduce yourself, ask what they do, and tell them you’ll let them get back to work. Don’t linger. Short and sweet is best. I swear, they won’t bite your head off. Some people are even looking for reasons to take a break. Now that you’re acquainted with your fellow coworkers, it’s time get to know them better. 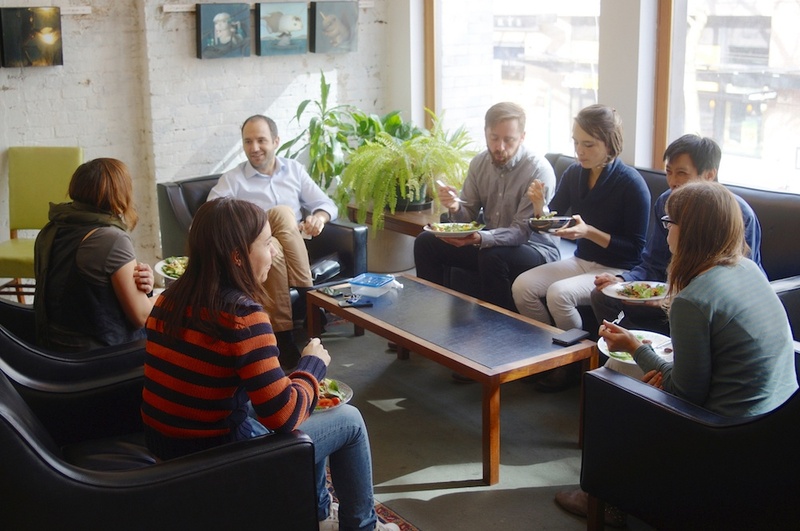 You might have heard the saying, “never eat lunch alone.” It’s never held truer than at a coworking space. Virtually all coworking spaces have common areas, so there’s no reason to eat lunch at your desk. If you need something to break the ice, try asking people about the space itself: how long have they been here? Do they like it? What’s nearby? Most coworking spaces host events for members and/or the public. Make it a goal to attend at least one event each month; ideally, aim for one every week. Attend events whether they are professional (e.g., lunch and learn) or social (e.g., happy hour). Yes, your time is valuable, which is why others will appreciate any time you can spare. Volunteering or doing pro bono work can be a great way to foster your network. Try offering to do a little volunteering for the coworking space itself, for example, by organizing a small event. Alternatively, offer to donate some of your expertise to help your coworkers out; the goodwill this can generate can be immense. For example, in the past, I mass mailed my space and offered to do a little pro bono work for a non-profit. Someone who I hadn’t met asked for help, and I made many great connections and friends through working with her. Over the last three years, I’ve grown my professional network, hired contractors and consultants, done both paid and pro bono work for others, and made lots of friends—entirely through my coworking space. My only regret is not trying coworking much sooner. If you are just a little patient, friendly, active, and contribute, you’ll be up and running socially in no time.